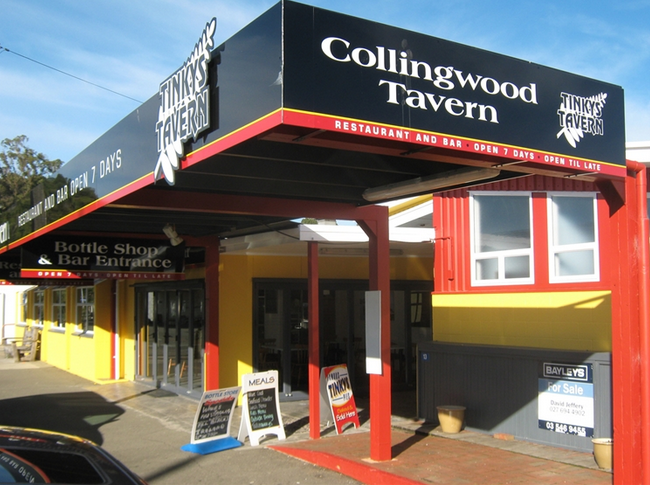 A trip to Golden Bay would not be complete without a visit to the famous Collingwood Tavern. Otherwise know as Tinkys Tavern named after the owner, David Covedern, whos nickname is Tinky. Collingwood Tavern is the hub of Collingwood, where locals and tourists gather to catchup on the local gossip and learn about whats been happening about the week. Tinkies has Sky TV and whenever there is a big rugby game or any sporting event the locals flock to watch the big screen and cheer on their favourite teams. Sometimes the toursits are backing the wrong team which adds to the fun. The restuarant has as extensive menu, from the famous Tinkies Pies to Whitebait Patties, mouth watering steaks and incredible takeaways. The quality is out standing and the prices are competitive. There are inside eating areas and outdoor eating areas including the garden bar. The Garden Bar is a great place to enjoy the views of the mountains and the esturay while enjoying your meal and a nice beer or wine. A few of the locals always achurn to the garden bar for the amazing sunsets over the mountains and Aorere Vally, you must bring your your camera. Tinky, the owner of the Collingwood Tavern sponsers alot of events throughout the year. One that is popular every week weather dependant is Friday Golf. Every Friday as many players that can make it head off to the Takaka Golf club, in Clifton Goldenbay and play18 holes of match play golf using the stableford scoring system. The loser has to buy the beer and its back to The Collingwood Tavern where Tinky offers up the beer at hugely discounted prices. You will find the winners reminding the losers who bought the beer late into the evenings. Once a year the Collingwood Tavern sponsers the Collingwood Golf Open. Anybody who has played Friday Golf is welcome to enter. Much like the Green Jacket played for at The Masters, Collingwood Open has The Brown Jacket. According to the many locals who visit Tinkys, Friday nights are the most enjoyable. Most locals and tourists in the summer all flock to The Collingwood Tavern to enjoy sky sports, especially cricket, super rugby, horse racing and of course when the All Blacks are playing the place is packed to the rafters. The Collingwood Tavern has a large TV and a huge projector screen that can be seen from everywhere in the tavern. There may not be alot of choices when it comes to eating out in Collingwood, but the high quality of Tinkys Tavern more than compinsates for that.